Editor’s Note: This article was first published in Professional BoatBuilder August/Sept 1999, issue No. 60. Read a new introduction by Eric Sponberg here. For more about recycling boats, also see “Boat Breaker” in PBB No. 160 and “The Unresolved Afterlife of Composite-Built Boats” in PBB No. 163. The single biggest obstacle to the sale of new boats is the gigantic oversupply of used ones. Both the price of used boats and the relatively fixed number of available marina and mooring spaces have a stranglehold on new- boat sales. Boatbuilders cannot produce a new boat that is competitively priced with its used counterpart. And a customer is not going to buy a new boat, or commission a new design, until he or she has sold the old one. As a boat designer, I see this happen regularly. 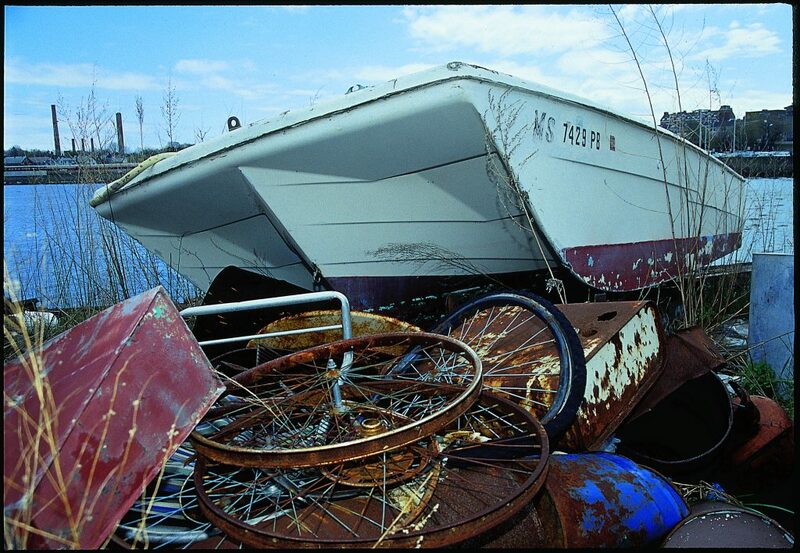 Because derelict fiberglass boats such as this one don’t necessarily die, they litter the landscape, as well as inhibit new-boat sales. The technology for recycling fiberglass is already available, and the necessary infrastructure—along with a cultural willingness to recycle—is coming soon in the United States. Fiberglass is great stuff, but the industry has shot itself in the foot by building boats out of such a durable material. We can build more marinas to ease the space problem, but that’s costly and difficult to do. Shoreline real estate prices are going through the roof, and environmental hurdles are expensive and time-consuming to overcome. We need a drain hole for old boats. Take them out of the market, cut them up, grind them into little pieces and use them for something else. If old boats go away, the market and marinas automatically have space for new boats, and business booms. Recycling is the answer. Here’s the proposed scenario: A boat recycling company brings into its plant—via purchases, donations, or governmental scavenging and cleanup—any boats it can find. All metal hardware is taken off the boats, including masts, rigging, stanchions, hatches, winches, anchors, chain, engines, tanks, wiring, batteries, and ballast keels. Hardware requiring less than one or two labor hours to clean up is stocked in a second-hand store on the premises. All other damaged or unusable hardware is sold to established metal recycling companies dealing in aluminum, steel, copper, or lead. Next, the fiberglass hull is sent through a series of pulverizers, separators, and grinders to reduce it to different grades of materials and grinds. These are then sold as commodities to manufacturing industries that can use them. Sound far-fetched? It’s not. In fact, the automobile industries in the United States and Europe have done considerable research into recycling fiberglass car bodies—determining how to do it (there are various methods available), whether it can be physically accomplished (it can all be done with existing technology), and its economics (unfortunately, recycling fiberglass is currently expensive). Automotive recycling is a significant and growing component of automobile manufacturing and for the same reason faced by the boatbuilding industry—too many cars on the road stifling sales. The boatbuilding industry has made only small and sporadic attempts to recycle its products, certainly nothing on the scale of the automobile industry. And boats have some particularly undesirable features that make them much more difficult to recycle than cars. But I think a goal of nearly 100% recycling can be achieved by our industry, and I think we can get a good start by looking at what has been done so far. Several European countries have made significant progress recycling composites. This 4.75m (15.5′) “concept” boat, for example, manufactured by Ryds Båtindustri AB—Sweden’s largest boatbuilder—contains 20% recycled fiberglass by weight. SMC stands for Sheet Molding Composite. This “leathery” material is generally composed of randomly oriented, short-chopped fiberglass in a thick (viscosity 5,000 to 80,000 centipoise) resin and filler paste. The resin is usually polyester (although sometimes it’s vinyl ester or epoxy), and the filler is calcium carbonate. Different fibers, such as carbon and Kevlar, can be used, but for most car applications, the SMC is short-strand fiberglass and polyester. SMC is a pretty simple material compared to boat hull and deck laminates. 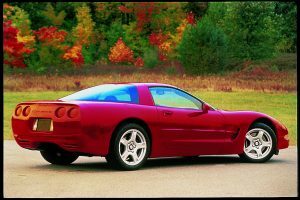 Probably the best-known automobile with a fiberglass body is the Chevrolet Corvette. 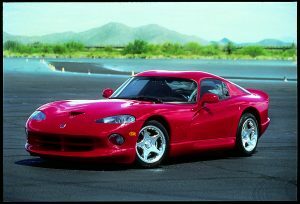 A ’99 corvette (above), the first generation of the Chevrolet sports car had a fiberglass body; since 1972, the body has been built of SMC, or sheet molding composite—as is the hood on the Dodge Viper (below). To mold car body parts, the SMC is first cut into pieces that fit the approximate shape of the part in its male-female, heated, compression tooling. The carrier film is removed, and several layers of SMC are stacked together in a predetermined sequence to make up what is called the “charge” inside the mold. If necessary, unidirectional fibers are carefully laid in the proper orientation and stacking sequence between layers in the charge to tailor various mechanical properties in the molded part. The mold is closed, heated, and pressurized; the charge flows through the mold to fill the entire cavity; and the part is cured, all in just a minute or two. The part is removed from the mold and allowed to cool to ambient temperature for later trimming, packing, and shipping to the assembly plant. SMC has obvious advantages over metal body parts, some of which are the same as we see in FRP boats: SMC is lightweight; its tooling costs are lower; it uses less energy to make the raw material; it costs less to mold; it has superior dent and corrosion resistance; and it has styling advantages you can’t get with metals. SMC was first introduced into car production for an air deflector on the 1966 Chrysler station wagon. Corvette’s body went all-SMC in 1972, and by 1993, close to 300 SMC components were on more than 100 domestic and imported cars. Automobiles with SMC parts include Lincoln, Mustang, Viper (hoods), Saturn (hatchbacks and station wagon roofs), Camaro, and Firebird (hatchbacks, roofs, and doors). Automotive SMC has grown from 40 million lbs in the 1970s to 270 million lbs in 1998, and it continues to rise. Total SMC usage in the United States is about 460-million lbs. By comparison, the Composite Fabricators Association’s best-guess estimate for the marine industry (whose numbers are difficult to compile because of its complex, diversiﬁed nature) is that it produced about 350 million lbs of molded fiberglass in 1998, which is only 10% of the total 3.5 billion lbs produced last year overall. Our society has been on a long road toward the responsible recycling of all consumer products, and cars are no exception. According to a recent automobile industry survey, the amount of scrap SMC produced by automotive molding facilities is estimated to be about 5% of production. So, 1998’s 270 million lbs of automotive SMC generated about 13.5 million lbs of scrap. Also, the accepted average life span of a new car is 10 years. Ten years ago, about 169 million lbs of SMC were produced, and many of those cars made from it are ready to be recycled. If we take just 5% of the SMC in those 1988 cars—8.5 million lbs—and add it to the 13.5 million lbs of scrap produced last year, we have 21 million lbs of SMC from 1998. That is one big pile of scrap! And that’s just last year’s total. Practically all of it has ended up in landfills. The trouble is, landfill sites, of which there were over 6,000 in 1990, number only about 2,500 today. The U.S. Environmental Protection Agency projects that the number of landfill sites will stabilize between 2,000 and 2,500 in the foreseeable future. With so much SMC and its scrap being produced, and the prospect of landfills filling up sooner rather than later, the automotive and plastics industries, through the Automotive Composites Alliance (ACA) in Troy, Michigan, have been working since 1990 to address the technical and economic challenges of recycling SMC. The ACA and the Society of Automotive Engineers (SAE) conducted pilot plant tests and performed various economic analyses to determine the feasibility and costs of recycling. They found that recycling is technically achievable, but it costs a lot of money, and there are few government regulations. As a result, companies are slow to recycle because, beyond being environmentally responsible, there is little incentive to do so. That is changing. • Closed-loop and open-loop recycling. Closed-loop recycling is when material producers, fabricators, or builders capture their own waste, convert it into a recyclate—a form that can be reused in manufacture—and process it back into their own products. This is the more common type of loop because it is relatively easy to do. For example, a boatbuilder might cut the flashing off the sheerline of a molded hull or deck, and instead of dumping it into a trash bin, he or she might grind it into a coarse, structural filler for keels, engine girders, or transoms. Open-loop recycling is when the recyclate is brought in from outside the manufacturing plant, such as from another manufacturing plant or from a central processing facility. This is much less common because not enough waste material has been collected in any fiberglass manufacturing sector to really support open-loop recycling on a large scale, although some does occur on a small scale. • Size reduction. This refers to turning big molded parts into chopped-up little pieces. For SMC, panels as large as 15 to 30 sq ft are shredded down to 2″ squares for some forms of recycling, or ground to powders for others. Size reduction requires big machines, such as knife mills, hammer mills, shredders, and grinders. SMC is relatively easy to break down because its glass content is nearly all short fiber. It’s fairly brittle and not very tough. Boat laminates, on the other hand, contain woven- and knitted-fiberglass fabrics, which are exceedingly tough on size-reduction machines. Mills and shredders that can reduce SMC will themselves break down when reducing boat-type laminates. This is one of the most difficult problems to solve in boat laminate recycling; the biggest, strongest machines that can do the job have not been built yet. • Clean stream vs. dirty stream. An example of clean-stream recycling is when manufacturers collect their own waste, sort it, grind it, and reuse it as a partial replacement for virgin material in their own process. The recyclate never leaves a controlled environment. Finely ground SMC, for example, replaces the calcium carbonate filler. Larger pieces and fibers become structural reinforcement. The cleanliness of the recyclate is very important to the quality of any new material in which it is used. The cleaner and more uniform the recyclate, the better and more predictable are the physical and mechanical properties of the new material. SMC containing 10% to 40% clean, recycled SMC can very nearly match virgin SMC in all respects. Once fiberglass leaves the plant—say, SMC is molded into a car fender, which then gets painted and installed on a car—the SMC becomes contaminated and is now in the dirty stream. Trying to get it back out of the dirty stream is a logistical nightmare. First, it has to be identified—different cars have different kinds of plastic and composite parts. Then, the car with the SMC fender has to be transported from wherever it is to a wrecking or shredding facility. The fender comes off the car and is collected with other composite parts—the pile of which contains road dirt, various plastics, glass, residual liquids, metal fasteners, wire bits, and all sorts of contaminants. From here, this pile requires other machinery and more energy to transport it, sort it, shred it, clean it, process it, sort it again, and then transport it yet another time to manufacturers who can reuse it. As the recycle stream gets dirtier, the effort to retrieve, process, and transport materials becomes more difficult and costly. And, as more variables affect the recyclate, it becomes less uniform, and more difficult to match the physical and mechanical properties required in the new parts. Three processing methods are used for recycling fiberglass: grinding, incineration, and pyrolysis. Grinding is the most obvious one—reducing material to small pieces or powders to be reused in other products. Potentially all material that can be reground can be used as recyclate; there is little or no unused waste. Incineration, or “thermal oxidation,” is burning the material to create heat for other purposes, such as making steam to power turbines that generate electricity. An unfortunate by-product of fiberglass incineration is ash, which—guess what?—usually goes straight to a landfill. The heat content of fiberglass laminates comes from the organic materials in the resin. SMC, for example, on which most incineration studies have been made, contains only 25% to 30% organic material, so its heat content is low, and its ash content is high. The ash is primarily calcium oxide, which comes from the calcium carbonate, boron, and other oxides in the glass. Interestingly, recent findings in Scandinavia have proven that composites are a suitable fuel and feedstock for cement kilns. Burning junk fiberglass laminate to create heat in the kiln (2,552°F/1,400°C) ensures its complete combustion, and the inorganic ash can be incorporated into new cement. Cement kilns, however, depend on large and steady quantities of feedstock to operate, and the recovery processes for composites are not mature enough to support the kilns’ voracious appetites. But, the potential for further development is certainly there. Pyrolysis is the process of chemically decomposing or transforming a material into one or more recoverable substances by heating it to very high temperatures in an oxygen-depleted environment. This is different from incineration, which takes place in an open atmosphere. (See the diagrams on page 89.) Pyrolyzed fiberglass decomposes into three recoverable substances: pyro-gas, pyro-oil, and solid by- product— all of which can be recycled. Scrap automobile tires are disposed of by pyrolysis (the tire mountain in the United States is over 3 billion tires, growing at the rate of 250 million tires a year). To pyrolyze SMC, it is shredded into 2″ squares that are fed directly into the pyrolysis reactor by a vacuum assist, which also draws off most of the oxygen in the atmosphere. The reactor is then heated to around 1,400°F (760°C). At about 500°F (260°C), the hydrocarbons in the resin decompose into gas. The gas is drawn off and sent through a scrubber, which separates it into pyro-gas and pyro-oil. The pyro-gas is very clean and has an energy content similar to natural gas. It can be sold as a natural gas replacement, and it fuels the burners of the pyrolysis reactor so that the reaction is self-sustaining. Pyro-oil is similar to heavy crude oil and, as such, it has less value than normal crude oil, but it can be blended with other fuel oils or incorporated into asphalt. Pyro-gas and pyro-oil comprise about 25% of the pyrolysis reaction output in roughly equal amounts. These are free of sulfur, halogens, phosphorous, heavy metals, or other elements that can cause environmental problems. Fiberglass waste can be pretty dirty as it goes into incineration and pyrolysis. It doesn’t necessarily need to be well-sorted, free of impurities such as metal bits and oil residue, or even be completely cured. In fact, discarded fiberglass can be mixed with most other kinds of plastics, and incinerated or pyrolyzed all at once; impurities and miscellaneous debris can be removed from ash or solid by-product much more easily than they can be removed from the scrap beforehand. 1. Tape three pennies to the scrap and set it outside the door of your plant. Someone will come to take it away, and you can simply go about your business. 2. Tape a quarter to that piece of scrap, walk a mile down the road, and give it to the recycle man who’s waiting there to take it from you. Then, walk all the way back to finish your day. Which are you going to do, really? There is another side to this problem. Materials and commodities made from recycled fiberglass are going to be for sale. You now have the choice of buying virgin or recycled material. Let’s say two salesmen come into your plant wanting to sell you filler for your fiberglass building process. The virgin salesman (okay, seriously) says he can sell you brand new filler for 5¢/lb, and the recycle salesman says he can sell you stuff that’s just as good, but it costs 30¢/lb. So, are you going to buy the virgin material or the recycled material? I think I know your answer. You’ll spend the nickel. It costs more to recycle than it does to dump, and it costs more to buy recycled stuff than it does to buy new. On a per-pound basis, these prices don’t sound like much money, but if your plant is generating thousands of pounds of fiberglass, the numbers amount to some pretty big bucks. The cost of dumping depends largely on the number of available landfill sites and on government regulations. In the United States, we have it pretty easy. Despite the declining number of landfills, as I mentioned earlier, there’s still plenty of landfill acreage left, it doesn’t cost very much to put stuff there, and regulations are minimal. The landfill situation in Europe is much different, where the recycling effort is more advanced than in the United States. This is important to U.S. boatbuilders and all U.S. manufacturers because we’re now shipping more boats and more U.S. goods to Europe. What happens there affects us here because our boats and products become subject to European laws. Also, as recycling regulations prove to be effective over there, similar laws and recycling practices will eventually come into effect here. It has already begun, as we’ll see shortly. One of our speakers at IBEX was Jack Simmons, of the R.J. Marshall Company, one of the very few firms in the United States making a business out of recycling open-loop fiberglass—primarily SMC. R.J. Marshall collects SMC, grinds it into different grades, and sells it again as its “Green Line” filler. The company’s mission is to be the leader in developing recycling technology and products in the thermoset composites business. Simmons has his finger on the pulse of the global fiberglass recycling situation, and he gave some perspective on the landfill/recycling picture in Europe. “Europe has the highest population density and the most complicated pollution problems,” Simmons said. “One country’s pollution can easily float or seep into another country’s sovereign territory. The direction of the legislation and regulations is to make landfill options very expensive. This higher expense makes recycling the lesser of two economic evils.” Where the cost of putting fiberglass scrap into a landfill in the United States is as little as 2.5¢/lb, the cost in Italy is 9¢/lb, and in Germany it’s 10¢/lb. The Netherlands banned all FRP scrap in landfills as of September 1997. Options there are to recycle, incinerate, pyrolyze, or ship it outside the country. Finding and collecting suitable boats for recycling suffers from problems of scale and logistics—there are just too many dead boats scattered over broad areas, and not enough people, money, and facilities to handle them. A news item I happened to see two years ago reported that Monroe County in the Florida Keys has that state’s worst derelict-boat problem, averaging over 100 collected and disposed boats each year. Monroe County spends between $1,000 to $3,000 to salvage a typical 20′ to 25′ boat, and all boats are trucked and dumped into landfills at $92 a ton ($100 to $150 per boat on average). If the county doesn’t retrieve them, the desperately poor will turn them into homes, which can create all sorts of other health and social problems. By 1997, Florida was spending about $250,000 a year on dead-boat cleanup, but could easily have spent over a million dollars if it had the budget to do so. Boat dismantling is a big problem. No one does it right now on a regular basis or in a business-like way. The automotive industry, on the other hand, has a large dismantling sector. About 14,000 car dismantlers and scrap processors in the United States dispose of 8 to 9.5 million cars a year. The more modern operators disassemble vehicles into major components and sheet metal, and inventory these parts for resale to consumers, garages, and collision shops. We don’t have a boat dismantling infrastructure yet. We have to create one because it is an essential part of the recovery process. AT IBEX, Chuck Fitzgerald of Sailorman—which sells used marine hardware—told us that his company does not dismantle boats, although Sailorman briefly tried this in the past. It takes a lot of work, he said, and is just too expensive to do, at least on his small scale. You need to dedicate employees to the task, and give them appropriate power tools to quickly and easily remove the gear. The people are available, but the machinery is not. So most of what Sailorman sells is donated, or it buys overruns and out-of-production excess stock. The good news is that Sailorman is a profitable business. Technology exists to encourage the recycling of composite boat parts. 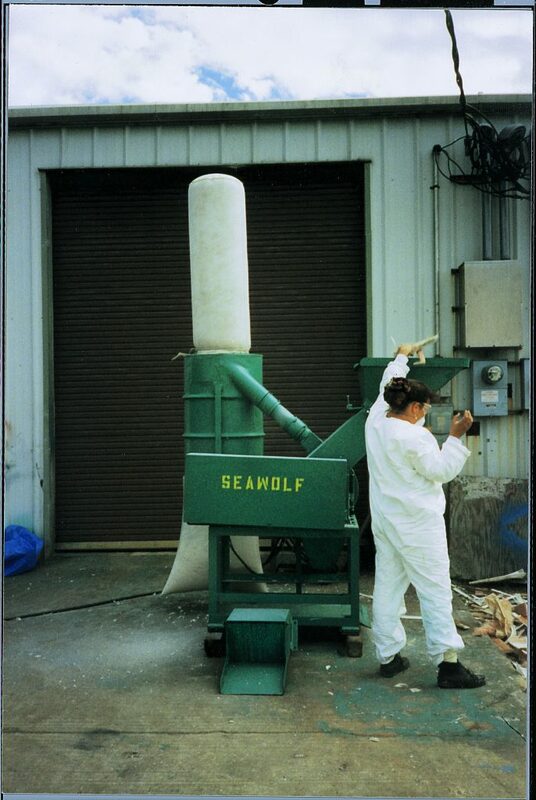 For example, Seawolf Industries’ patented grinder reduces small pieces of fiberglass waste into reusable materials—fibers up to 18mm (3/4″) long and particles 4.8mm (3/16″) in diameter. There are buyers out there who want and need this stuff. A salvage firm in Fort Myers, Florida, for example, had some success salvaging boat hardware and selling it over the Internet. Each month, 40,000 buyers logged on, and typically 2,000 to 3,000 buyers placed orders. For reasons unknown, this operation went out of business, but I can’t believe its demise was due to a shortage of customers. A shortage of products would seem more likely, if not other political or economic reasons. Sailorman is taking steps to branch into the enormous and potentially lucrative Internet market where the firm can reach many more customers searching for a wider variety of items. At IBEX, Jack Simmons also highlighted a number of other technical problems related to boat laminate size reduction. I’ve already mentioned that current reduction mills tend to break down when chewing up boat laminates because the woven- and knitted-glass fibers hold themselves together so well. High-energy impact can cause the glass-fiber bundles to explode into what looks like lots of small cotton balls. Nothing can be done with these—you can’t wet them out with resin again, and they clog spray equipment. They simply have to be screened out of the recyclate and landfilled. 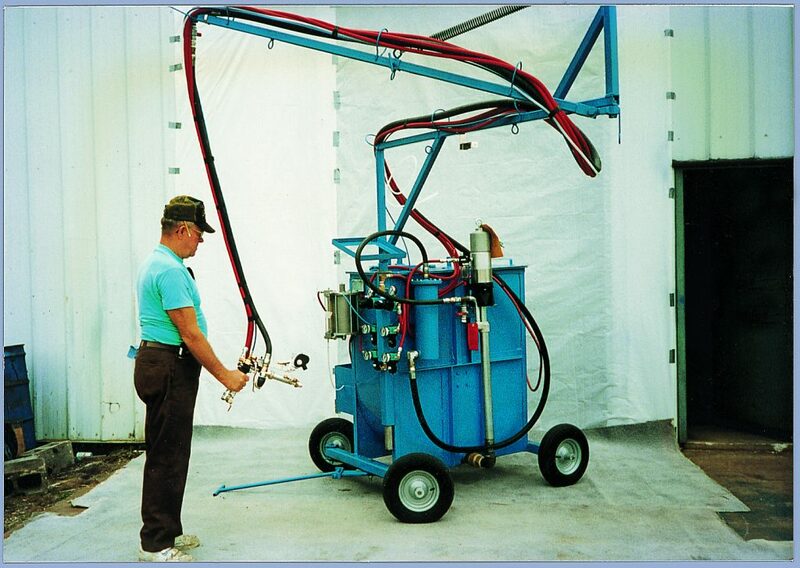 Seawolf’s specially designed spray equipment mixes ground-up fibers with a filler and resin to produce a sprayable core that can replace plywood or other materials in certain applications. Room-temperature-cured boat laminates tend to have unreacted catalyst in them, which, once ground up, can cause the recyclate to burst into flame by spontaneous combustion. Moreover, unreacted catalyst in a recyclate in any new product can cause its cure cycle to go haywire. Also, grinding laminates creates a lot of dust containing small fibers, which pose a serious health hazard. So the storage and handling of the recyclate has some serious re-manufacturing and safety issues that need to be addressed. Finally, the size of the recyclate is a critical factor in maximizing reinforcement value. Coarser materials have higher reinforcing value, but they tend to clog spray equipment and wear it out quickly. Finer grinds sometimes need a special filler system to carry the resin/filler/recyclate through the spray equipment and deliver it to a mold. Specialty fillers assist in casting situations, such as transoms or filled structures like bottom girders or deck bosses. Interestingly, flame and smoke suppressants can be added to these filler systems, and they come in a variety of densities, so it’s possible to tailor some of the properties for castings made with recyclate. Has Anyone Built Recycled Boats? As a matter of fact, yes, in Sweden. 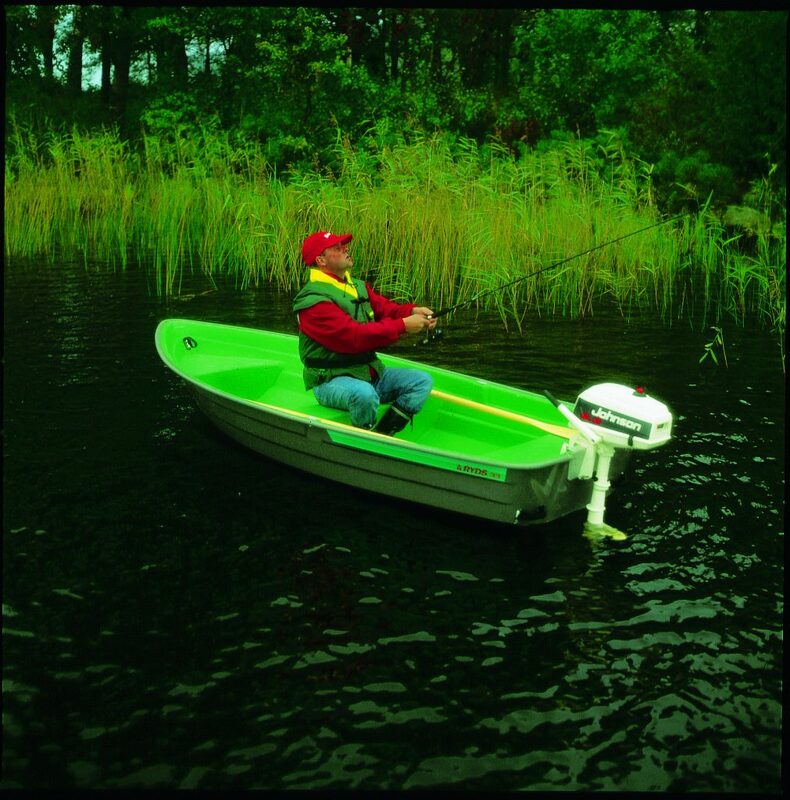 Ryds Båtindustri AB is Sweden’s largest boatbuilder, producing about 3,600 small powerboats each year in 36 models ranging in size from 3.3m (11′) to 5.95m (20′)—so Ryds goes through a lot of fiberglass. About six years ago, with the help of the Swedish Institute of Composites, Ryds began development on manufacturing boats with closed-loop recycled scrap, which accounted for about 10% of its layup production. The result was a 4.75m (15.5′) concept boat, containing about 20% recycled fiberglass by weight. The original single-skin laminates of sprayed-polyester fiberglass in the hull and deck were cut back by 50% and replaced with a sprayable polyester mixture containing 33% to 40% ground scrap. Core materials, such as plywood, Coremat, and Divinycell, were replaced with the scrap mixture. The boat’s laminates had equal or better strength in all respects and, where the recycled compound replaced plywood, screw-holding power improved significantly. 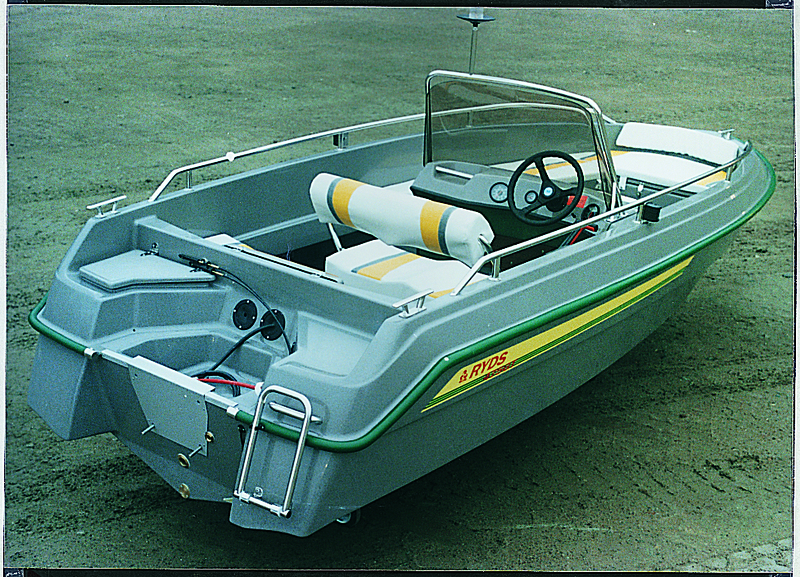 Ryds built this runabout with a sprayable polyester mixture containing 33% to 44% ground scrap. Two years ago, Ryds anticipated its concept boat would go into production at about 50 boats per year. Unfortunately, economic and production realities are not strong enough to support this goal, so recycled production boats will have to wait a little longer. Ryds is the only boatbuilder in the world that I have come across who has even gotten this far. Eventually, there will be others. It’s only a matter of time before fiberglass recycling becomes commonplace. I started this article with a proposed scenario of boat recycling, nearly duplicating a short piece I wrote eight years ago for a marine industry newsletter. I can see what has happened in the intervening years, and I believe I know where fiberglass recycling is going. Four things are readily apparent to me. First, the fiberglass industry has accomplished a lot in defining and developing recycling technology, and the future holds much promise. We have only just begun to figure out what we can do with recycled fiberglass. But what I thought would be a five-to-ten-year process will likely take a generation, which leads me to the second point: We are still on a very steep learning curve. We have a long way to go before fiberglass recycling is a mature part of manufacturing. Third, the FRP boatbuilding industry is comparatively small (11% of the total thermoset composites market), and so we are not alone. Fiberglass recycling demands a huge supply of scrap material to fill the pipeline in order to make the various processes work continuously and economically. That supply is out there, and it’s enormous, but it’s divided into too many small sectors. One of the biggest problems is simply collecting enough scrap material from the very diverse producers who are spread all over the country. Reliable and continuous scrap collection requires an infrastructure that we do not have, and it’s just going to take time to build it. All fiberglass producers, not just the marine industry, will have to participate in advancing that collection process. Fourth and finally, recycling starts in our own backyards. The simplest way to get going is to reuse our own scrap. The investment in in-house recycling hardware is generally pretty small, and technical help now is not too far away. Gradually, businesses and industries will start working together to invest in bigger and better recycling processes and machinery so that near-total recyclability will happen. The recreational boat market needs nothing less. About the Author: Naval architect Eric Sponberg retired from practice in December 2015 so he and his wife, Arliss Ryan, can sail his first boat design, Corroboree—which they now own—around the world (see “Eric Sponberg is Going Sailing,” Rovings, PBB No. 159, for more on Sponberg’s career and future plans). The Pacific Rowboat featured in Professional BoatBuilder No. 160 is his latest design.